The wait is over! 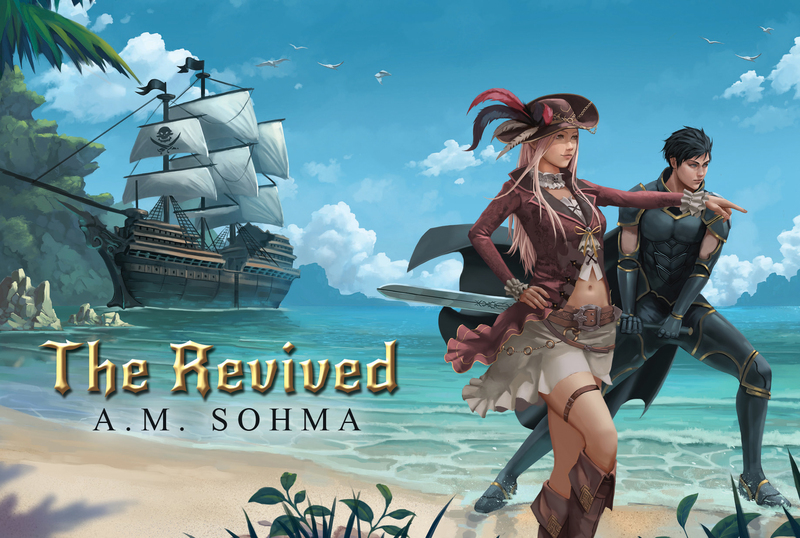 The pre-order for The Revived (Book 3 in the Second Age of Retha series) is now available. The book releases on Friday, September 14th! The Revived features even more of what you’ve come to expect from this series: crazy characters, amazing fantasy locations, funny one-liners, and more high stakes situations for Kit and her team to get through. And the slow burn romance is there for those of you who are rooting for Kit + Solus Miles. This book has been in the works SO LONG, I’m so excited to finally be able to share it with you! It is $4.99, but that’s because it’s waaaay longer than my other books. (Take my longest fairy tale and add on my longest King Arthur and Her Knights novella. It’s just a bit longer than that!) I hope you guys enjoy it when it comes out, and thank you for your endless patience! Just finished reading The Revived and whoa– it is awesome! I miss the old characters though… but I LOVE the new ones. Also, it may be just me but I seem to like Noir a lot because he reminds me a tiny little bit of Seer Ringali… is it just me? Oh god I hope you wrote the next two and are in editing already I’m hooked and need to know what happens! I love Solus Miles and I need to know what happens with him and Kit! Sadly no, I’m cranking out Snow White right now for its December release. Reading The Revived now. Swear K.M. Must have been inspired watching the little kids riding sheep at a rodeo. That and when the little kids have try and get in a miniature horse are the reasons for watching the Calgary Stampede. HAHAHAHA, yes I have actually seen it! Between that, and there’s a specific clip of a sheep bouncing spastic-ly around a bunch of border collies, those were the two things that inspired it. Just finished The Revived and can’t wait for book 4. It was laugh out loud hilarious, filled with great new characters, more eyerollingly awesome drama, and excitement and fun for all. Woohoo! I love how long this is! One thing: the blog posts aren’t getting sent to my email, for some reason! I subscribed but I’m missing them! Do you know what’s happening? Hmmm I’ll have one of my assistants look into it–though it might automatically get sorted into your spam file so I would check there, too. But in the mean time, is the email you have listed the email you used to sign up? Yup! This email is the one I use. Sadly it’s not in my spam either! I tried to unsubscribe and resubscribe to see if that would help, but I don’t think it did. Thank you! Thanks for releasing it on my birthday, Kitty. It feels like a birthday gift XD. Awww, thanks Debbie! 😀 I hope you enjoy it–I will say it is a little harder to keep the pace moving when they’re so long. I wanted to scream at them when they were breaking into Elba “WHY HAVE YOU NOT WON YET?!? !” Lol. I am not the most patient taskmaster for my characters. I purchased it the day it came up for pre-order 😀 I can’t wait for tomorrow! I’m so excited!! Can it be friday already?!?! Your work is more than worth the extra dollar, can’t wait to start reading! Awww, thanks Cherie, that’s really sweet of you to say! Ahhhh!!! This is so awesome!!! Can’t wait til Friday! Yeah yeah yeah!!! I’m so excited!! 😆 Friday can’t come fast enough! Thanks kitty! !